Three varieties of the 1802 1/16th Scheepjesgulden. 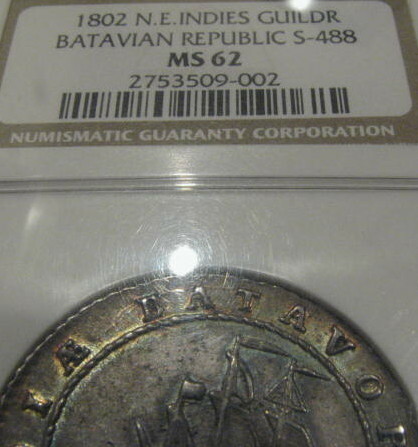 I have found three different graded varieties of the one sixteenth gulden and NGC has been able to recognise only two.The third has not been sent to them I can only assume. The two varieties that they have graded are marked S495 (18 coins graded) and S497 (5 coins graded). The S represents probably the Scholten Catalogue which I do not have and can only assume that S496 is the third variety waiting to be graded. The real interest is that PCGS has only graded one , one sixteenth gulden and that does not have a rope around the ship. All of the NGC coins have a rope around the ship , hence PCGS has graded the elusive S496 I presume and so far is the only one graded. Krause's Standard Catalogue of World Coins 2006 does not mention the Scheepjesgulden series at all but the CD version of Krause 6th edition does , in fact it has a big picture of one on the CD cover. The CD catalogue does not however go into any details of the varieties apart from saying that they exist for each denomination. The Official Coin Catalogue of the Netherlads East Indies does give details of varieties but only for the one eighth (two) and one sixteenth (three). That coincides more with what I have found on a world-wide search of this series.I have yet to see any other such varieties of the 1/4,1/2 or 1 Gulden but will be happy to be proved wrong. I was first under the impression that S495 and 497 are one and the same coin until I read the Dutch Catalogue. The variety graded by PCGS is easy, there is no rope around the ship, no brackets around the date,smaller coin etc but can you see the difference between S495 and S497 ?? I will give a Mandela birthday coin to the first correct answer!!! The clue lies in the Obverse. The twist in the tale is that I nearly sold the only PCGS coin when I had a second coin graded MS64 by NGC- until I realised how pretty the pink and blue toning was in the lower grade. I must admit that the significance of no rope around the ship was missed then. By the way, I sold a 1/16th gulden (variety without the rope around the ship) in October last year here on Bid or Buy to Free State Coins. Here is a thumbnail picture of that coin. You have hit the nail on the head. Its the position of the middle mast relative to the first "A" and second "A" of BATAVORUM , in the case of S397, the middle mast is closer to the "T" this making the ship stand up more vertical and less leaning over and in the case of S395, the middle mast is closer to the second "A" making the ship lean over more from the vertical. I didnt realise there are similar varieties based on that for the bigger coins - do you have Scholten? I owe you a Mandela R5 - payable at the first Collectors Society AGM. See the pics of that area of each bigger coin in my collection. Do you know what makes S496 a special category? Is the no rope around the ship? You must surely aggree that the one eighth G deserves a special category at NGC with no rope around the value ? I unfortunately do not have Scolten's handbook, but know that it was also published in English. I once saw a first edition in the South African Cultural Museum's extensive numismatic library. It was housed in the Australasian building behind the Groote Kerk in Cape Town. I used to collect the Ship Guildens and bought them from Munthandel G. Henzen of Amerongen in the Netherlands. BTW, Scholten's granddaughter by marriage (or at least a relative) is still running the old numismatic firm in the Netherlands in partnership with Eddy Absil, who used to have a coin business in Johannesburg. Mast position is not such a huge difference but no rope around the value in the 1/8th Gulden is really worth opening another variety at the Grading Company , dont you aggree? Yes, I agree. They could / should just follow the varieties identified by Scolten. The Scolten number for the 1/8 Gulden with innercircle around crest is 494c whilst the vatiety without the innercircle is 496b. Speaking of varieties, do you know that the One Gulden Scheepjesgulden was also struck in gold? It is exceptionally rare. Its Scolten number is 489. "The golden sample of the schipsguilder 1802 is struck at the second Mint of Holland under responsibility of Mintmaster Hessel Slijper and with dies cut by Gerrit Konsé. The star in the texts on the reverse is the Mint mark and shows that the coin is struck in Enkhuizen and not in Dordrecht. This piece is made on a weight of 3 1/2 ducat. Scho 489; Delm. 1172; KM (Indonesia) 83a." You need big accolades from all the collectors amongst us for your factual input to coin knowledge on this Forum. Keep it up !! I will send the Scholten categories along with the one eighth Gulden coin pics to NGC and have the categories extended hopefully with your info thanks. 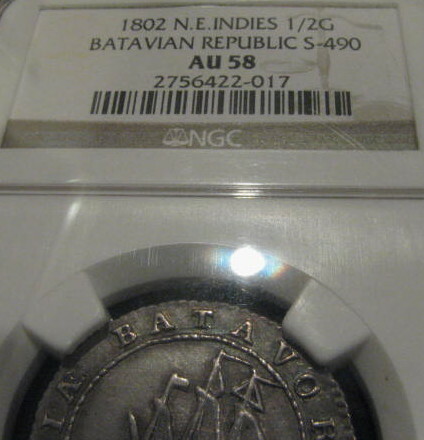 Yes there were Gold 1802 Scheepjesguldens S-489 two graded by NGC ,both MS63 and I think I have seen one for sale in a past Heritage Auction. Even rarer are the fractions in Gold as I understand and NGC has graded one Half in MS63 (S-491) and one Quarter in MS63 (S-493). Those two coins have never come to any auction as I understand. The Gold Scheepjesgulden are described by Sir John Bucknil (Spink &Son 1931) in an article titled "The Coins of the Dutch East Indies" as well as the other varieties of the silver Scheepjesgulden. These gold coins were made in Proof and only of the the top three denominations (Guilder,Half Guilder and Quarter Guilder). Four such coins were sold in 1900 from the van Oosterzee Collection ie 1 Guilder , 2 Half Guilder (of separate dies) and 1 Quarter Guilder. 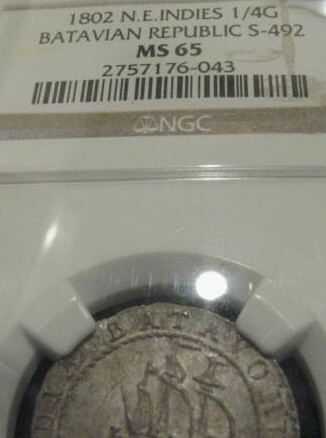 Some of these have now been graded by NGC.